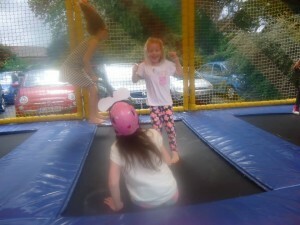 On the 28th of June we held our annual summer garden party – or rather we held our party and the weather couldn’t dampen the fun even if it tried! The night before the party our giant slide had to be changed for something that could be used in the rain, and so instead we had fun trampolines under covers, a bouncy castle with rain cover and a football strike out (you kicked the ball at targets to win points). As soon as the children arrived they started playing with our inflatable goodies and the animal walker balloons were played with throughout. 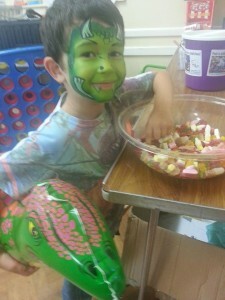 I never saw Aiden’s brother, Alfie, without the dinosaur one and he even had his face painted to match! 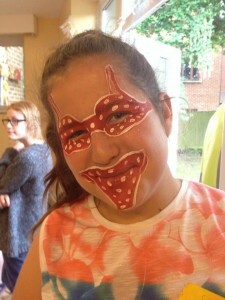 The children enjoyed having their faces painted, tattoos done, and having coloured hair extensions. One little girl stood in the entrance to the hall with a half shy/half proud expression and pointing to her coloured hair – she was clearly thrilled with it and wanted to show everyone! 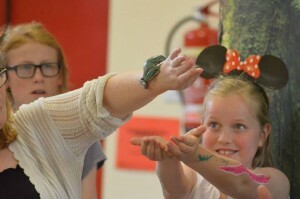 Luanna from Froggle entertained the children with puppets, magic, dancing competitions, balloon models and party games. 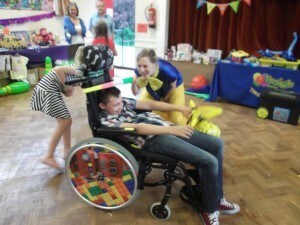 At the Post Pals party being in a wheelchair doesn’t stop you taking part in usual party games like the limbo! 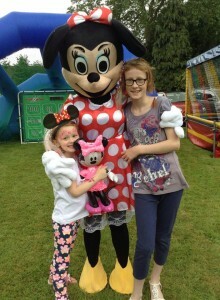 Shortly after, Minnie and Mickey Mouse as well as Peppa Pig popped by the party to the delight of many. Meggie (who has been extremely poorly recently) had her face painted as Minnie and we gave her the Minnie Mouse ears to wear while she excitedly awaited their arrival. She told us that Minnie is her best friend. 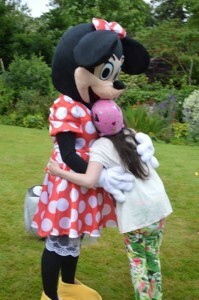 Lots of children loved them but Meggie cuddled them, danced with Mickey and then told Minnie she had been a good girl and taken all her medicine. She asked Minnie if she sometimes has to take medicine and Minnie nodded. Meggie then said ‘I’m going to get better and so are you’. It’s a good job mice can’t cry and everyone who overheard had to wipe their eyes. Families spent a while relaxing both indoors and out, and also playing with items volunteers had kindly purchased from our Amazon wish list. 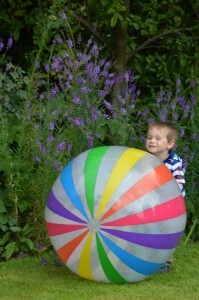 It’s amazing how much joy a £1.39 inflatable mallet or £4.99 ball can bring. We also did BUBBLES! We started off making them for the children but they soon got the hang of it. 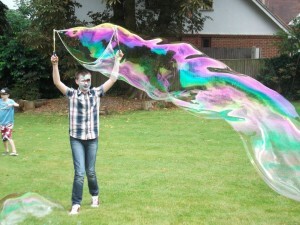 Even tiny 3 year old Finley created huge ones, although I think biggest bubble of the day goes to Connor. 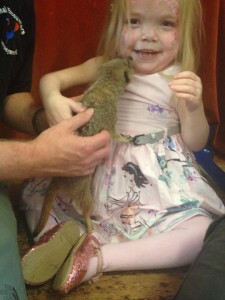 Then it was back inside to meet some animals and it was no normal animal petting session! We had lots of animals there and not only learnt about them, but also got to hold or touch many of them. A range of animals from owls to a baby alligator, from ‘Kyle’ the skunk to a big fruit bat with bad table manors. A few people were allowed to feed the bat and were told that bats spit out what they would be unable to digest. Courtenay always goes for something a little different when it comes to having her face painted at the party and this year she decided on a bra and knickers set. It got a bit smudged though when the fruit bat spat a grape in her face! Then she had a baby Meerkat stand on her head and perch on her hair bobble to peak between the Minnie Mouse ears on her headband. I can just imagine her being back at school and saying what happened while others say they watched the football or hung out at the weekend! We took a break to cut the amazing cake which had kindly been made and donated by Kellie and collected by Sam (a big thank you to them both). We reflected on 11 years of making seriously ill children smile. Although our party is a fantastic day where we all come together, Post Pals is special in that we provide support every single day of the year through all the ups and downs of living with a serious illness. After this reflection we went straight onto the raffle which the kids LOVE. They feel so lucky as they happen to keep winning. While lots of children hovered around the ticket bowl picking ones out and calling the number, I glanced across the room and saw one of our Pals sitting there oblivious to the chaos and just cuddling her prizes looking happy and contented. Later, Kate took over a Dalmatian cuddly dog prize and said it could be a friend for Spotty Dog (the child’s cuddly dog from our Dottie scheme) and she beamed and hugged her new friend tightly. We then went straight back into meeting even more animals before finishing with a huge yellow python! Everyone who wanted to got to be ‘it’s tree’ and reactions ranged from determination to overcome their fear, to total jubilation and pride. 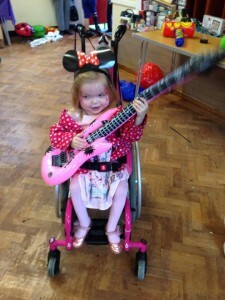 Ella had just been released from hospital earlier in the week after a traumatic 6 month stay and transplant. Two of her all time favourite things are Minnie Mouse and Meerkats, so after the animal show she got her own session with them. As we were outside it was time for the annual wheelchair race (we missed having you in it Philip, I hope you’re able to come next year). As always, I came last! This time Connor won – at one point tiny Nico was pushing him up the hill and his eyes (with Batman mask face painted) were peaking up over Connor and the chair as he pushed with all his might! Tyanna also helped push Eleanor in her electric chair. 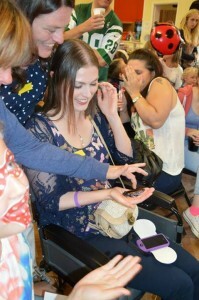 Everyone was cheering us on and there was a little envy by some that they don’t have a cool wheelchair! 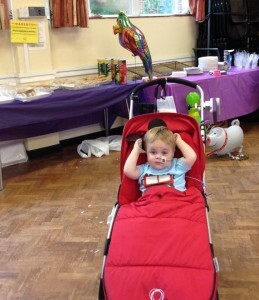 Families slowly started going home armed with the most amazing party bags kindly made and donated by Bev. Not only did Bev kindly pay for it all but you could see the thought, time and love, put into every single one. The kids were thrilled and one little girl showed me her Minnie Mouse bracelet she got in hers about 10 times! It was a lovely day and impossible to sum it up in words or even in pictures, but here is a couple of things said which gives a tiny peak into why the party is more than your typical celebration. “Thank you to the little girl who played with Meggie and didn’t notice she was ‘different’, it’s the first child outside of our family to ever just play with Meggie.” Meggie is 12. I don’t know where to begin the thanking people as so many people contributed to the day and I’m sorry if I accidentally miss you out. Firstly, a big thank you to Dawn and Steve. The bulk of the work and chaos always falls to them and our house and life is over run by party stuff for at least a month around this time of year. Steve works long hours in London but has been up until midnight every day doing Post Pals work. To everyone who fundraises or donates. Someone asked if donations on the day of the party pay for it – the answer is that they don’t. The party isn’t an event to raise funds, it’s paid for by kind people who donate or fundraise during the year. Suzi, Judith, Jemma, Dot, Liz, Malcolm, and all the volunteers who worked away in the background helping keep the party running smoothly and also enabling Dawn and Steve to get home before 11pm this year! 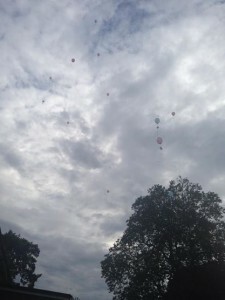 To Dan, Karen, Marie and Toni for organising the balloon release – every label was done in the child’s favourite colour and memories of each child were thought of while inflating them. 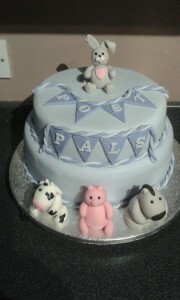 Kellie for the lovely cake, Bev for the party bags, and to those who ordered from our Amazon wish list. I did the list on the off chance someone might like to contribute an item and was shocked when an hour later everything had been ordered. The same happened with the next 2 lists! Some of the children took inflatables home with them but the rest will be used again next year along with things like bubbles and streamers. Stephen from Pearce’s bakery in Bookham for yet another amazing buffet. Thank you to Ben the animal man. When I decided to have animals at the party it was important to us that we find someone who not only entertains the children but who truly cares for the animals and looks after them well. Ben is part of a small group called ‘Impeyan Group’ who do animal talks and parties, they don’t keep any profit for themselves and instead put it back into the animals and conservation projects. 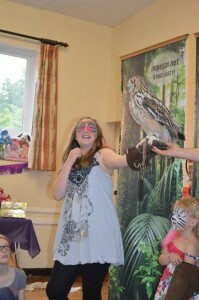 The party was a huge hit and I would highly recommend them to anyone looking for animal parties in the South East. Last but not least a HUGE thank you to Kyle or ‘Kyle the Man’ as we now think of him. He spent the whole party working hard, whether that was carrying heavy objects, ‘helping’ Mickey Mouse, playing with the children, loading up cars – you name it, Kyle did it. Thank you Kyle you’re a star.